The present investigation was performed to determine the impact of the dietary inclusion of ginger powder (Zingiber officinale) on the growth performance, immune response, slaughter traits, blood biochemistry and gut morphology of broiler chickens. One hundred and eighty unsexed broiler chicks (Avian 48) were randomly allocated to four equal groups (45 birds each) (G1, G2, G3 and G4), and each treatment had three replicates (15 birds/replicate). The G1 group was fed with basal diet, G2, G3 and G4 were received the basal diet plus 2 g/kg, 4 g/kg and 6 g/kg ginger powder, respectively. The trial lasted for six weeks. The results demonstrated a significant decrease in the final bodyweight of G4 compared with those of G2 and G3. However, total feed intake improved in G2 and G3 and decreased in G4. The lowest feed conversion ratio (FCR) was observed in chicks of G3, followed by that of G2. At 42 days old, the ginger-supplemented groups showed significant increases in hemagglutination inhibition (HI) titre against Newcastle Disease virus. Significant increases in the leucocyte count (WBCs) and serum total protein were noticed only in G4, and cholesterol and high-density lipoprotein (HDL) levels decreased significantly in G4. In addition, the serum very-low-density lipoprotein (VLDL) and triglyceride levels decreased significantly in the ginger-supplemented groups compared with G1, and the abdominal fat percentage significantly decreased in the G3 and G4 groups. Additionally, the ginger-supplemented groups showed higher villus lengths and greater crypt depths than the control group. Supplementation with ginger powder at a moderate level up to 4 g/kg diet has beneficial effects on growth performance, and up to level 6 g/kg diet improves histological gut parameters and hypolipidemic properties of broilers. The growth and laying performances of birds are frequently improved by using growth promoters or feed additives that have a positive impact on the growth and immune responses. Among these substances, antibiotics are no longer used as feed additives, because they are associated with residues in eggs and meat products, and their use has been restricted in many countries (Botsoglou et al., 2002). The beneficial effects of natural products are greater than those observed with antibiotics (Manesh et al., 2012), including a lower cost of production and reduced toxicity hazards (Devegowda, 1996). Herbal feed additives have shown beneficial effects on broiler growth and carcass parameters (Schleicher et al., 1998). Many types and forms of herbal feed supplements have been used to maintain and improve the health of human beings (Freeman & Kodera, 1995) and chickens (Ahmed et al., 2015). Herbal extracts can also reduce the blood cholesterol level and improve immune system functions (Mathivanan & Kalaiarasi, 2007). Herbal supplements have antioxidant actions in broilers (Hui, 1996), activate immune responses, promote antimicrobial and anthelminthic actions and stimulate endogenous enzymes that enhance the digestion process (Omar et al., 2016). Ginger (Zingiber officinale) is widely used in many countries as a spice, food condiment and medicinal herb for certain ailments in traditional medicine (Tapsell et al., 2006; Zhang et al., 2009). The main important compounds in ginger are gingerol, gingerdiol and gingerdione, which can stimulate digestive enzymes, gastric secretion and blood circulation and act as an enterokinetic (Incharoen & Yamauchi, 2009). Several pharmacological effects of ginger have been reported, such as its anti-ulcer effect and potent antibacterial, antifungal and anthelmintic activities (Akoachere et al., 2002; Demir et al., 2003; Great, 2003). Moreover, Bhandari et al. (2005) concluded that the ethanolic extract of ginger significantly reduced serum total cholesterol and triglyceride levels, increased the high-density lipoprotein (HDL) cholesterol levels, protected tissues from lipid peroxidation and exhibited a significant lipid-lowering activity in diabetic rats, while Arkan et al. (2012) suggested that ginger had a positive effect on growth performance parameters in broiler chicks. Habibi et al. (2014) and Zena et al. (2017) concluded that ginger powder in broilers did not improve growth performance. Thus, the present work aimed to study the influence of ginger powder supplementation at various levels of dietary inclusion on the growth performance, immune response, carcass characteristics, blood biochemical parameters and gut morphology of broiler chicks. One hundred and eighty one-day-old broiler chicks (Avian 48) of mixed sexes were used in this experiment. The average weight of chicks was 45.62 g. The chicks were wing banded and randomly allotted to four equal groups (45 chicks per group) (G1, G2, G3, and G4). Each treatment had three replicates (15 birds/replicate) and received various treatments during the experimental period (6 weeks). The chicks were housed in a room that had previously been disinfected with formaldehyde gas and were reared at 33 °C for the first week of life, 3 °C per week after that, and 21 °C during the fifth week of life. The chicks were supplied with continuous light for the first two days of life, and then received 23 hours of light and 1 hour of darkness per day. The chicks were vaccinated against certain viral diseases during the trial period using live vaccine (Hitchner +IB at day 7, intermediate infectious bursal disease at days 12 and 20, Lasota at days 17 and 28) through eye drops, while inactivated Newcastle Disease and Avian Influenza AI vaccines were applied at the tenth day by intramuscular injection. Four diets were formulated for the starter, grower and finisher phases. Ginger was purchased from a local market, sundried, ground to a fine powder, and stored in an airtight polyethene bag until required for use. The G1 group was fed with basal diet and G2, G3, and G4 groups received teh basal diet plus 2 g/kg, 4 g/kg and 6 g/kg ginger powder, respectively. Forty five chicks were housed for each of the four dietary treatments, with three partitions per treatment and 15 birds in each partition. The experimental procedures were performed according to the guidelines of the National Institutes of Health (NIH) for the Care and Use of Laboratory Animals and certified by the Committee of the Faculty of Veterinary Medicine, Alexandria University, Egypt. 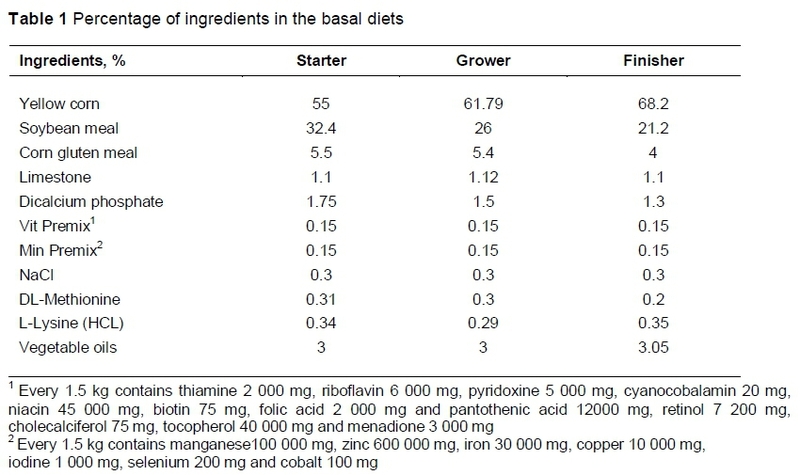 The diets were formulated according to the NRC (1994), and the ingredient composition and analysis (AOAC, 1985) of the basal diet (BD) are presented in Tables 1 and 2. The chicks were weighed individually to the nearest gram at the beginning of the experiment and every week for six weeks. The difference between two successive weights was calculated as the bodyweight gain. The daily feed intake was calculated as the difference between the offered feed and the remaining feed at 8 am daily. The feed conversion ratio (FCR) was calculated by dividing the total feed intake by the total body gain. Mortality percentages were calculated as a percentage of dead chicks from the total number of each group. Three blood samples were collected from each replicate at the end of the experimental period and then left to coagulate at room temperature. The separation of serum was conducted by centrifugation at 3000 rpm for 10 minutes. Serum total protein, albumin (globulin was calculated) concentrations, the activities of the enzymes, alanine aminotransferase (ALT, EC 2.6.1.2) and aspartate aminotransferase (AST, EC 2.6.1.1) were measured as well, total cholesterol (low-density lipoprotein (LDL) and HDL ). The very-low-density lipoprotein (VLDL, calculated), triglycerides and glucose levels were determined according to Doumas et al. (1981), Reinhold (1953), Reitman & Frankel (1957), Kind & King (1954), Sidney & Barnard (1973), Giorgio et al. (1974) and Trinder (1969), respectively. Moreover, three additional blood samples were collected from each replicate in tubes containing anticoagulant to determine blood haemoglobin (Hb) and packed cell volume (PCV), according to Eilers (1967). Red blood cells and leucocyte count (WBC) were counted according to Hepler (1966) and Lucas & Jamroz (1961), respectively. Hemagglutination inhibition (HI): Six blood samples were collected from each group at 21, 28, 35 and 42 days old. The blood samples were centrifuged to separate the serum and estimate the antibody titre against the ND using a hemagglutination inhibition test, according to Grimes (2002). Differential leucocytic count: At the end of the study period, blood films were prepared as described (Lucky, 1977). Ten drops of May-Grunwald stain were added to an equal amount of distilled water on a dry unfixed smear, mixed, and left for one minute for staining. After decanting the dye (without rinsing), a diluted Giemsa stain was poured over the film as a counterstain, left for 20 minutes, then rinsed under a water current and examined by an oil emersion lens. Absolute and percentage values were calculated for each cell type (Maxine, 1985). At the end of the experiment, three birds were selected at random from each replicate. The birds were fasted for eight hours before weighing, and then slaughtered for complete bleeding. Weights of the hot carcass, heart, liver, gizzard, proventriculus, abdominal fat and lymphoid organs (bursa, thymus and spleen) were calculated as a percentage of slaughter weight. Immediately after slaughtering, the small intestine was dissected free of its mesentery. Small specimens were collected from the control and treated chicks. Specimens were immediately fixed in neutral buffered formalin (10%) for 24 hours. Fixed specimens were processed through the paraffin-embedding technique. Sections at four micrometres thick were prepared and stained by haematoxylin and eosin (HE), according to Bancroft et al. (1996), for the histopathological examination. A quantitative computerized morphometric analysis was performed on images of the prepared sections. The images were analysed using ImageJ software (Bethesda, MD, USA) to measure the villi height, crypt depth and villi width at the crypt/villus junction as well as the tip. The measurement was based on the reported mean value of 15 villi/sample (x10). Data were subjected to an analysis of variance (ANOVA) using SAS (2004), followed by Duncan's test to estimate the significance between treated groups. Means were significant at P <0.05. The geometric mean of the estimated Hemagglutination inhibition titres was calculated according to Brugh (1978). The effect of dietary supplementation of ginger powder at levels of 0 g/kg, 2 g/kg, 4 g/kg and 6 g/kg diet on the performance traits of broiler chicks during the study period is presented in Table 3. The ANOVA showed non-significant differences in the initial BW of broiler chicks between groups. In addition, during the sixth week of life, broilers of the G2 (ginger at 2 g/kg diet) and G3 (ginger at 4 g/kg diet) groups recorded higher non-significant (P >0.05) increases in BW than the birds of the G1, although the birds of G2 and G3 had higher (P <0.05) final BW compared with those of G4 (ginger at 6 g/kg diet). Concerning total bodyweight gain (BWG), total feed intake (FI), FCR and mortality percentages, the results showed that the total BWG of G4 was significantly lower than those of G2 and G3. Differences in total BWG among the G1, G2 and G3 groups were not significant. Concerning the total FI, a non-significant increase was observed for G2 and G3 compared with G1. Increasing the ginger powder level in the diet to the level of 6 g/kg diet (G4) resulted in a non-significant (P >0.05) decrease of total FI compared with that of the G1. G3 had the best FCR, followed by G2. Group G4, which was fed the highest level of ginger powder (6 g/kg diet), showed an increase in the FCR. Mortalities were not recorded in G3 and G4. The effects of dietary ginger powder supplementation on certain blood parameters of the broiler chickens are listed in Table 4. WBC count showed non-significant increases in G2 and G3, but significant increases (P <0.05) in G4 compared with G, while non-significant differences were recorded among the groups for red blood cell count (RBC), Hb concentration and PCV%. Table 5 shows the effects of ginger powder supplementation on certain blood serum parameters of the broiler chicks. A significant increase in the serum total protein (TP) was observed in the G4 group compared with those in the other treatment groups and the control. On the other hand, a significant (P <0.05) decrease in cholesterol levels was observed in the G4 group compared with that in the control group, although this decrease was not significant (P >0.05) compared with those in the other ginger-treated groups. The HDL levels significantly decreased in the G4 group compared with those in all the experimental groups. Moreover, the VLDL and triglyceride levels significantly decreased (P <0.05) in all groups supplemented with ginger compared with those in the control. 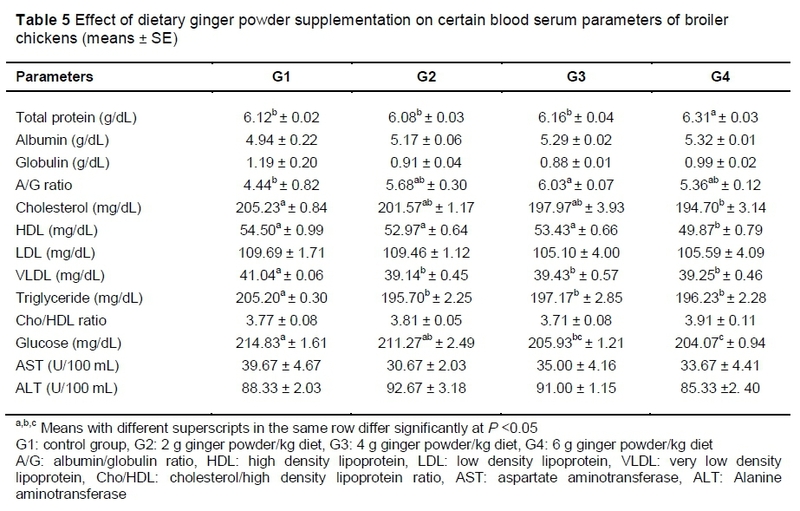 In addition, ginger powder supplementation led to a significant decrease in the serum glucose level (P <0.05) in G3 and G4 compared with that in G1. Significant differences in the serum AST and ALT activities were not observed among the experimental groups fed diets without or with ginger powder at various levels. Table 6 shows the effect of dietary supplementation with ginger powder at levels of 2 g/kg, 4 g/kg and 6 g/kg diet compared with that of the control diet with the Hemagglutination inhibition (HI) titre to the Newcastle Disease Virus. The data showed that significant differences in the HI titre did not occur among the experimental groups at days 21 and 28, whereas the HI titre started to increase with higher levels of ginger supplementation (G3 and G4) at day 35. At day 42, all groups fed diets supplemented with ginger powder showed significant (P <0.05) increases in the HI titre compared with the control group. Differential leukocytic count and phagocytosis: The effects of dietary supplementation of ginger powder at levels of 2 g/kg, 4 g/kg and 6 g/kg diet compared with the control diet on differential leukocytic counts and phagocytosis are summarized in Table 7. Significant differences did not occur in the differential leukocytic counts among the groups supplemented with ginger powder and the control group. The results showed a non-significant difference in the PA and PI between the ginger-supplemented groups and that in the control group. The PA was numerically (approaching significant) increased by approximately 7.2%, 7.2% and 9.6% in G2, G3, and G4, respectively, compared with that in the control group. 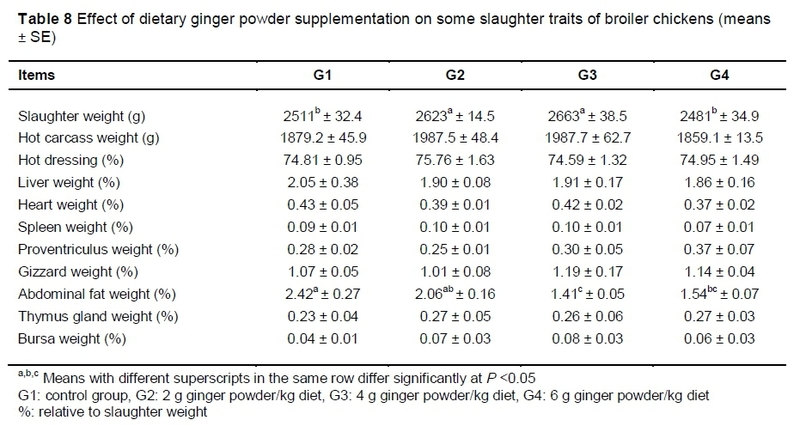 Non-significant differences were observed in the slaughter traits, including the dressing percentage, relative liver, heart, spleen, proventriculus and gizzard weight (%), among the groups receiving different levels of ginger powder (Table 8). However, the relative abdominal fat weight was significantly (P <0.05) decreased in G3 and G4 compared with those in the other groups. The relative weights of the thymus gland and bursa increased in all groups supplemented with ginger compared with those in the control. 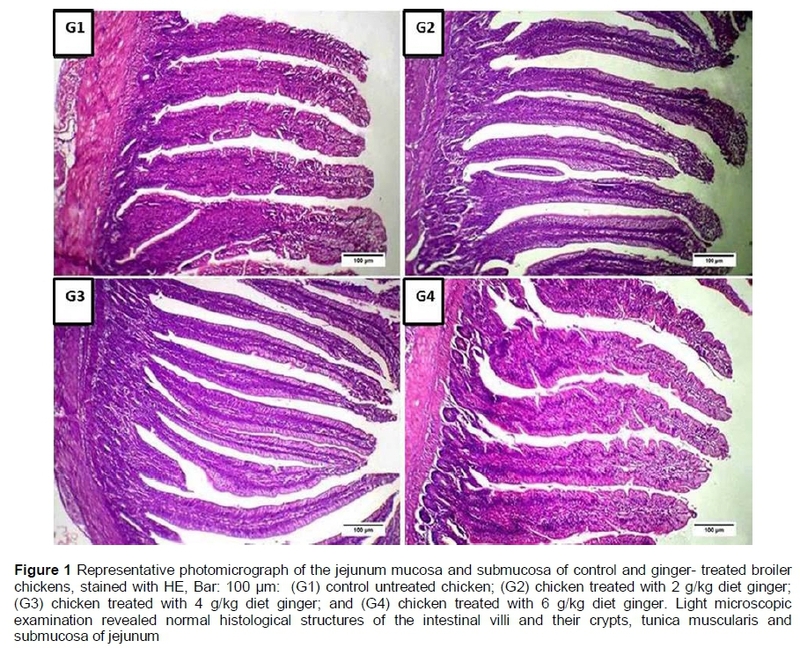 The mucosa and submucosa of the jejunum from the control and ginger-treated broiler chickens showed normal histological structures of their villi and associated crypt, tunica muscularis and submucosal tissues (Figure 1). As presented in Table 9, significant increases in villus height and villus width at the crypt/villus junction (P <0.05) were reported for all ginger-treated groups relative to G1. However, the villus width at the tip and villus height/crypt depth decreased (P >0.05) compared with those in the control group (G1). The G3 group recorded the highest crypt depth (P <0.05). In addition, the crypt depths of groups G2 and G4 were significantly higher (p<0.05) than those in G1. The parameters of growth performance, immune response, liver biomarkers, lipid profiles, slaughter traits and gut morphometry were examined in the current study. These parameters are good indicators of the potential improvement effect of ginger supplementation at different levels on broiler performance. In the present study, final body weight, total body gain, total feed intake and feed conversion ratio improved after supplementation of ginger at levels of 2 g/kg diet and 4 g/kg diet. Meanwhile the broilers that received higher level of ginger (6 g/kg diet) showed decreased BW, total BWG, total FI and increment in FCR. These findings were in accord with those reported by Herawati & Marjuki (2011), who found that increasing ginger to a ratio up to 2% (20 g/kg diet) reduced the feed intake and total weight gain. In addition, the results are consistent with the report of Herawati (2010), who stated that broilers fed 2% dried supplementary red ginger meal had significantly lower feed intake than those on the control diet, and the decreased feed intake resulted in a corresponding decrease in weight gain as the supplement levels were increased. Zhang et al. (2009) reported no significant effects of dietary ginger supplementation (5 g/kg) on the weight gain of broilers. On the other hand, Onimisi et al. (2005) and Ademola et al. (2009) observed that ginger increased the BW when included in the diet up to 2% level. The reduced BW observed for the diet with 6 g ginger/kg diet could be related to the reduction in feed intake and subsequent reduction in BW with the excessive use of herbal plants because of the strong bitter taste (Ficker et al., 2003; Hosseini, 2011). The findings of FCR are consistent with Arkan et al. (2012), who concluded that birds fed 0.1% and 0.2% ginger had better FCRs. The improvement of the final BW, total FI, total BWG and FCR in G2 and G3 may be attributed to the potential of ginger and its active ingredients to stimulate the salivary and gastric glands secretions decrease the levels of pathogenic bacteria and form more stable intestinal flora with subsequent improved digestibility (Great, 2003; Incharoen & Yamauchi, 2009). Regarding total protein, ginger in the highest level (6 g /kg diet) had greater TP than other groups. These results are consistent with those of Zhang et al. (2009), who concluded that the inclusion of ginger in the diet at 5 g/kg diet increased TP and lowered cholesterol concentrations in the serum of broilers. The same authors suggested that the increased TP concentration in the serum of broilers supplemented with ginger is consistent with the enhanced antioxidant enzyme activity. The lipid profile parameters including total cholesterol, total triglyceride, HDL, LDL and VLDL were decreased in ginger-supplemented groups, suggesting the hypolipidemic effect of ginger. This finding is consistent with those of Ademola et al. (2009), who found that the dietary supplementation of ginger significantly decreased the serum cholesterol and triglyceride levels in broilers. Moreover, the total cholesterol and serum LDL concentrations significantly decreased in the ginger-supplemented group (Shanoon et al., 2012). Using dietary ginger can reduce the total serum cholesterol by inhibiting hydroxyl-methyl-glutaryl-coenzyme-A reductase (HMG-CoA) or by increasing the excretion of bile acid and faecal cholesterol (Malekizadeh et al., 2012). In addition, ginger powder supplementation led to a significant decrease in the serum glucose level (P <0.05) in G3 and G4 compared with that in G1. This result agrees with Saeid et al. (2010), who found that the serum glucose level decreased in broilers supplemented with 0.4% and 0.6% aqueous ginger extract. The accepted explanation for this significantly reduction may be inhibition of hepatic phosphorylase enzyme by dietary supplementation of ginger, where it is able to abrogate the breakdown of hepatic glycogen storages. Likewise, it can stimulate the activity of the enzymes, improving glycogen synthesis (Zhang & Tan, 2003). The groups supplemented with different levels of ginger had improved HI titre against Newcastle Disease at 42 days old in comparison with control. These findings are consistent with those of Nidaullah et al. (2010) and Azhir et al. (2012), who observed that aqueous extracts of ginger had a better performance as an immune stimulant against Newcastle Disease. However, ginger did not affect differential leukocytic count, red blood corpuscles (RBCs), haemoglobin (Hb%) and packed cell volume (PCV%). These findings are consistent with those of George et al. (2015), who found that haematological parameters, including differential leukocytic counts, such as lymphocytes and neutrophils, and Hb concentration and PCV were not affected by the dietary supplementation of ginger at 2 g/kg, 4 g/kg, and 6 g/kg diet. In the current study, phagocytic activity was increased in ginger-supplemented groups. This may be attributed to ginger-associated immune enhancement. These results are consistent with those of Al-Shuwaili et al. (2015), who recognized that ginger supplements in broiler chicken diets have a strong stimulating effect on the immune and digestive systems. Concerning the slaughter traits, the relative weights of various organs were not affected by ginger supplementation, except for the decreased relative weight of abdominal fat. Similar to these results, El-Deek et al. (2002) demonstrated that carcass weight did not differ between the control and ginger-treated broilers. Additionally, Onu (2010) and Erener et al. (2005) did not observe a significant effect for ginger powder supplementation in various levels on the slaughter traits of broilers, while Ademola et al. (2009) stated that the dietary supplementation of ginger significantly decreased the abdominal fat of broilers. This reduction in the abdominal fat percentage in ginger-supplemented chicks may be attributed to the lipid-lowering effect of ginger (Sharma et al., 1996). Analysis of intestinal morphometry exhibited significant increment in villus height in all ginger-supplemented groups. This increment indicates an increase in intestinal surface area and absorptive strength Oladele et al. (2012), with subsequent elevation in BW and improving in FCR in these groups. Likewise, mean value of crypt depth was significantly raised in groups supplemented with ginger at levels 2 and 4 g/kg diet. It is well known that crypt cells are responsible for the secretion of electrolytes with the subsequent release of water into the intestinal lumen, which could improve nutrient digestibility (Bowen, 2011). These findings were in agreement with those reported by Karangiya et al. (2016). Based on the current findings, dietary supplementation of ginger powder at level up to 4 g/kg diet plays a role in improving broiler growth performance and gut morphometry. Moreover, inclusion of ginger up to level 6 g/kg diet contributed to improvements of the immune response, and a reduction of the cholesterol, triglyceride and glucose levels. We gratefully acknowledge Egyptian Knowledge Bank (EKB) (www.ekb.eg) for supporting the English editing of the manuscript at the author services of Springer Nature. RSS planned, designed, and supervised the experiment. RSS and AET performed the complete experimental trial. AET analysed the data and helped in the extraction of plant material.